Stauf’s is a Columbus based coffee company that has a small chain of coffee shops and restaurants in the city, mostly under the name Cup o’ Joe. 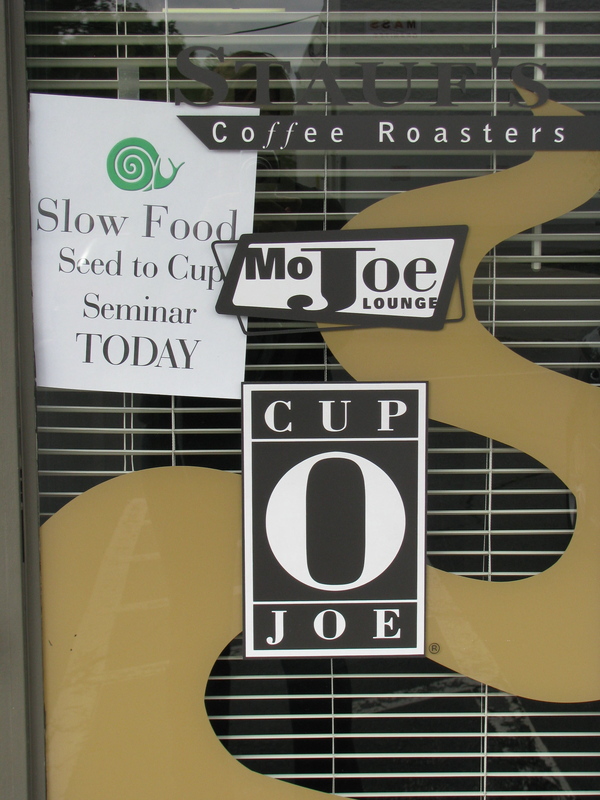 They have one coffee shop under the Stauf’s name in Grandview and some combined coffee shop-bars called Moe Joe Lounges (big plus, they serve Jeni’s ice creams too). I believe that the company was originally founded in the 1980s. 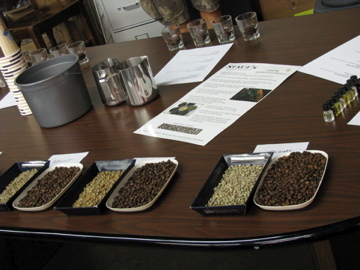 I went to a coffee tasting and education session at Stauf’s roastery organized by Slow Food Columbus and presented by Mark Swanson, the president of Stauf’s. 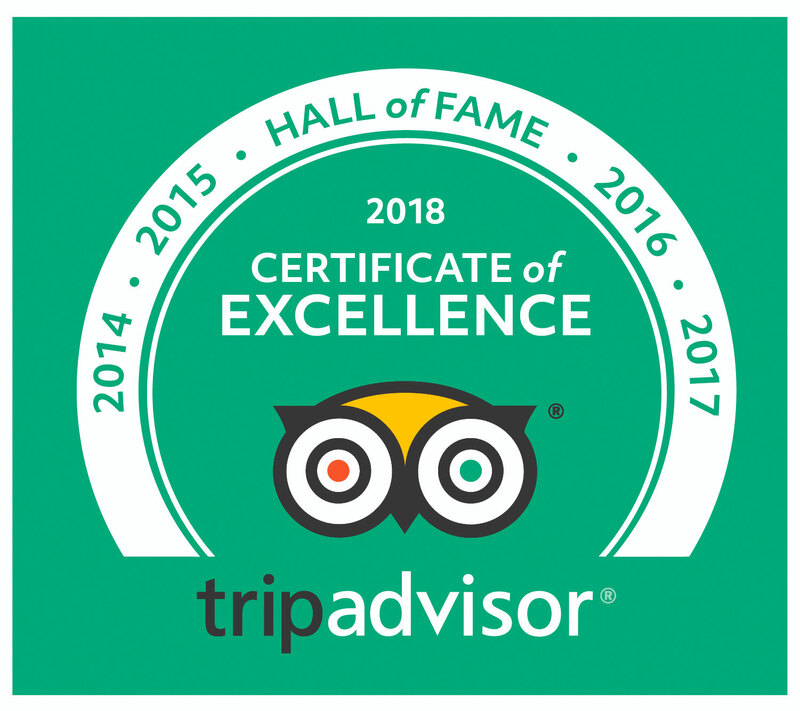 It was wonderful how enthusiatic Mark and his staff were about their coffee despite being at work on a Sunday morning. I love coffee but I am not a complete coffee junkie so felt a little out of my depth during some of the discussion. I did learn a lot about coffee both as an agricultural product and the art and science that goes into brewing a perfect cup. After we were sufficiently caffeinated Mark started his presentation on coffee growing and showed us slides from some of his travels to different coffee growing areas. As a geographer I was fascinated by the range of countries that tripped off his tongue. He mentioned at least 20 countries directly in the course of his talk, but apparently coffee is grown in at least 70 countries. We saw many of the different stages that the coffee goes through to extract, dry and grade the beans and some of the different methods of sorting from hand sorting to hi-tech. Coffee beans have certainly been touched by a lot of hands before they reach the coffee pot. 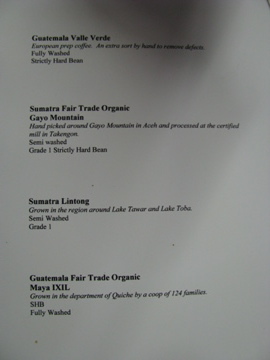 Some of the things we learned about were grafting arabica and robusta plants and how this impacts the crema and caffeine content (arabica have 1/2 the caffeine content of robusta) and shade versus sun grown (choose shade – more involved to grow but better for the environment and better flavor). Mark said that increasing communication between the growers, roasters and consumers is helping quality coffee to thrive and that the Fair Trade and organic movements are helping to make people aware of some of the issues surrounding coffee growing. After the slide show we had a chance to try ‘cupping’. 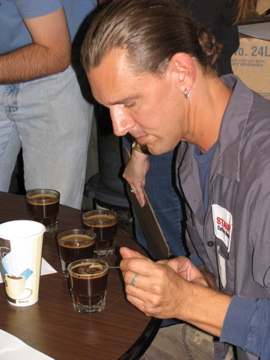 This is how the experts taste and evaluate coffee. We tried four different coffees. You start by smelling the grounds, then add water, wait and then break the crust of grounds to taste the coffee. The little bottles in the right of the photo were scents such as grass, leather, caramel and coffee flower to help give us flavor references. As Mark pointed out, all coffee tastes like coffee. There is less variation than you get in wines, so you are looking for nuances. 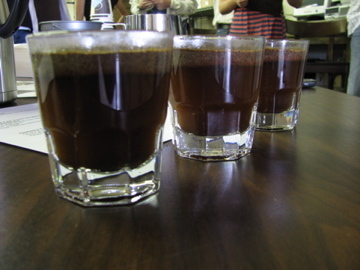 Coffee is evaluated primarily on body, acidity and flavor. Body is a perception of the weight and viscosity; acidity is how long the flavor lingers on your palate and flavor is noticeable and notable tastes related to four flavor perceptions: sweet, sour, butter and salt. We watched Tom Goetz, Stauf’s chief roaster roast some Guatemalan beans into two different roasts, full city and vienna. Stauf’s roasting process is increasingly scientific and they are constantly trying to learn more and improve what they are doing. They now use an Agtron machine to measure the color spectrum which helps to reduce the subjectivity and variability of the roasting process. The aim of roasting is to keep as much of the sugar in the coffee as possible and temperature control is key to the correct caramelization. You can lose sugar if the roast is either too hot or too cold and if you are looking at roasted beans you can break one in half to look at the color uniformity. If the roasting temperature was too hot, the outside of the bean will be darker than the inside. 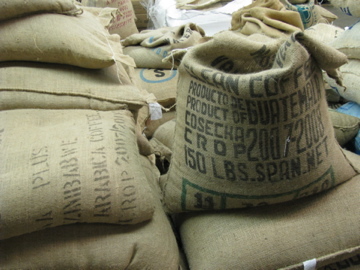 In the process of turning coffee beans into brown water there are a lot of variables that determine the flavor and how much of the bean gets into the beverage. After the beans are selected and roasted, there are still a whole slew of variables: the grind, the brew strength, the length of time and the temperature, all of which have an impact on the final cup of coffee. We tested the same coffee brewed at 3 different strengths (measured in parts per million) and it was surprising how much difference there was. Despite the science involved and some of the high tech equipment we saw demonstrated, it was very apparent that there is still a lot of art that goes into producing a great cup of coffee and in the case of Stauf’s a lot of passion as well. Very interesting post Bertha. Had to look after 80 odd hectares of arabica when I worked for my cousin in Malawi. I’ll send you a pic of green pinhead through red cherry to two grean beans. BTW. My latest post back atcher! One thing worth emphasizing, too, was Staufs’ generosity. We each walked out with a free goodie bag containing 2# of the coffee that they’d just roasted… and some chocolate-covered espresso beans… and some coupons for free drinks… and a coffee scoop… all in all, a real treat. But I agree, the enthusiasm of Mark and his crew was contagious and was the very best part of the morning for me. 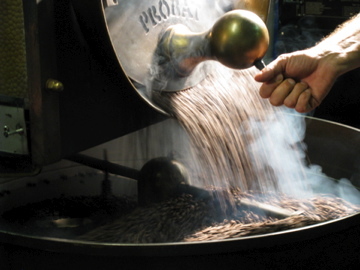 Bethia – what an amazing photo of the beans coming out of the roaster! Brought back the lovely memory of that morning:) Thank you! Just discovered your blog and enjoying it much. I’ll be back!